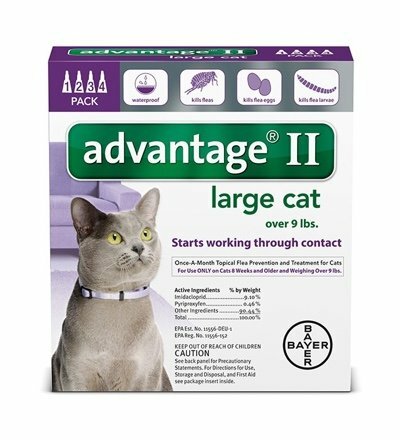 Advantage® II is a topical flea control for cats that kills fleas through contact, so fleas do not have to bite to die. Advantage® II kills fleas rapidly within 12 hours of initial application. Reinfesting fleas are killed within 2 hours with protection against further flea infestation lasting for up to a month. Pyriproxyfen provides the additional benefit of killing flea eggs and larvae to effectively break the flea life cycle. For use on cats and kittens 8 weeks of age and older, weighing 2 lbs. or more.